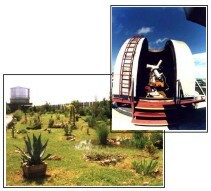 The observatory astropark for public with opportunity for all nature lovers to see asteroid models and arboretums. If there is favourable weather, you can observe sun spots or cityscapes by telescopes. The observatory of the Rimavská Sobota was founded in 1975. On 4th October 1977 its operational building was put into use as a first observatory functional building in Slovakia. Before foundation of observatory, there was not, scarcely, any astronomic background in the district. Since 1st April 1999, after abolishment of the regional cultural centres, administratively it belongs to the Regional Observatory in Banská Bystrica as its branch office. Interpretation, educational and methodical activity is aimed at all age categories and school types. Each year the observatory organizes about 250 actions for 10 thousand people. In addition to the rich offer of the interpretation and educational programs (lectures and lecture cycles, conservation, thematic hours, observations, movies, video reels, ecological programs, practices, meetings, etc. ), also the competitions are organized: art design competition - Vesmír očami detí, quiz competition - Vesmír je náš svet, Kozmonautika, Príroda okolo nás, Let na planétu Mystery, Robinson roku 2000, etc. A methodical assistance and exit observations on demand are provided to the group members. In the observatory area, the summer astronomic camps, practices and alternative schools are organized. There is a specialized library and video-theca available for groups and co-operators. Professional activity of the observatory is oriented on the Sun observation, indirect solar radio astronomy; positional measurement of the star obscuration by the Moon and asteroids, including expedition observations of the tangential obscuration, observations of the meteors and comets, lunar eclipse, as well as observation of the non-obscuration variable stars. Over the last years, the observatory has become a Slovakia-wide coordinator and operator of the observation of the meteors and tangential obscuration of the stars by the Moon. The results of the professional observations from the area of the observation of the Sun, meteors and obscuration are published not only in our country but also abroad (Solar Index Data Center, Solar Geophysical Data, International Lunar Occultation Centre, European Asteroidal Occultation Network, International Occultation Timing Association, International Meteor Organization, etc.). We are the official members of IMO, IOTA, within EAON we are the national coordinators. More remarkable observation foreign expeditions: total solar eclipse on 11th August1999 (Fonyódliget, Hungary), observation of the meteoric Leonida in 1998 (Mongolia), 1999 (Spain). The observation devices are standard. The Coudé refractor 150/2250 is located in the cupola with diameter of 5 m. In the free-standing observation point with diameter of 5 m built by volunteers is located the refractor 160/2450, Cassegrain 350/4200 and protuberance telescope 100/1200. Portable instruments are used also at the public observations and observer expeditions. The lecture hall with capacity of 60 places is equipped by an audiovisual and didactic technique with an ability to use the large-area projection and computer animations, what is mainly recognized by teachers during the additional education of pupils and students. The accommodation capacity in the fenced area in so called “UNIMO cells” is 21 beds, en suite facilities, kitchen, what an organization of several-day collective events allows. In the last years, thanks to the voluntary work of employees, the wide area of the observatory has been a subject to the soft landscaping with relaxation nooks (pergola, UFO-focus point, lake). Since 1994, the Secretariat of the Slovak Non-professional Astronomers Association www.szaa.sk resides in the observatory premises.